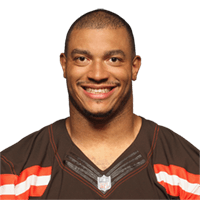 Published: Dec. 27, 2015 at 04:31 p.m.
Cleveland Browns linebacker Nate Orchard intercepts Kansas City Chiefs quarterback Alex Smith after the pass was deflected. Published: Nov. 30, 2015 at 11:37 p.m. Published: Dec. 7, 2014 at 01:49 p.m.
Indianapolis Colts quarterback Andrew Luck fumbles into the end zone after being sacked by Cleveland Browns defensive lineman Desmond Bryant. Ball is recovered in the end zone by Browns linebacker Craig Robertson for the touchdown. Published: Sept. 30, 2013 at 04:19 a.m.
(4:39) B.Green-Ellis left guard to CLV 9 for -2 yards (D.Bryant; D.Jackson).